There has been a huge amount of media coverage regarding the tragic northern California fires, documenting the terrible loss of life and billions of dollars of damage to buildings, infrastructure, and the economy. As I write this, the death toll has risen to 41, over 5000 buildings have been destroyed or damaged, and the estimates of the financial loss are in the tens of billions of dollars. Media stories have blamed the catastrophic fires on many things: a dry environment after the typical summer drought, unusual warmth the past several months, excessive rainfall producing lots of flammable grass, strong winds, global warming, and the lack of vegetative maintenance (clearing of the power lineright-of-ways) by the local utility (PG&E). A unique mountain-wave windstorm produced the strongest winds in the historical record at some locations. 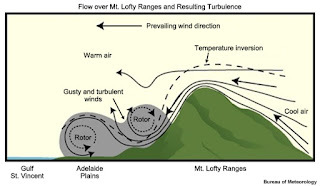 An event produced by the unlucky development of just the right flow regime that interacted with regional mountains to produce extreme winds beyond contemporary experience. In short, this blog will make the case that the extreme nature of the wildfires was the result of a very unusual weather event, one that our weather models had the ability to forecast and warn about, if only their output were applied more effectively. The blog also suggests that better use of state-of-the-art weather prediction offers the hope of preventing a similar tragedy. Although there have been a lot of media reports about windy conditions, few have described the extreme, often unprecedented, nature of the winds on Sunday night and Monday morning (October 8/9th). Some have even mocked PG&Es claims of hurricane-force winds, suggesting wind speeds of 30-40 mph. Let's clarify a few things. There was a wide range of winds that night, with the strongest winds on ridge tops and on the upper lee slopes of terrain. Some winds was startling. For example, at 10:30 PM on 9 Oct 2017 the wind gusted to 96 mph on a 3400 foot peak NE of Geyersville, about 20 miles NNW of downtown Santa Rosa. They reported sustained 74 knots (85 mph). Those are hurricane force winds (sustained of 64 knots or more). At the Santa Rosa RAWS station (U.S Forest Service and Bureau of Land Management) at 576 ft elevation, the wind accelerated rapidly Sunday night to 68 mph (see below). A few miles to the NNW and a bit higher (2000 ft), winds at the Hawkeye site accelerated abruptly to 79 mph. What is really amazing about the winds at these sites, was that they were unprecedented: the strongest winds on record, with records going back to 1991 (Santa Rosa) or 1993 (Hawkeye). And we are not talking about winds during the fall, but winds any time during the year. Even during the stormy winter season when powerful storms can cross the region. At low-levels, the situation was more mixed. For example, at Napa Valley Airport (36 ft), the sustained winds at 11:15 PM October 9 (37 knots) were the strongest observed (looking back to 2001) at that location from July 1- November 30, while at the Santa Rosa Airport (KSTS) the sustained winds only reached 28 mph, with 40 mph gusts. So why were the winds so strong and unprecedented at higher levels in the hills? These winds were key for causing the wildfires to explode and to quickly move into populated regions. And the winds undoubtedly damaged power transmission lines and thus helped start electrical fires, which may, in fact, have initiated the big wildfire runs. And why were the lower-level winds less severe? What can explain such differences? When strong flow interacts with terrain, the air can be greatly accelerated. 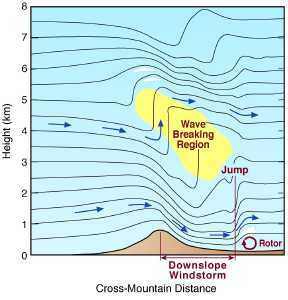 The schematics below show you some situations, with air accelerated over and downstream of mountain crests. That night (Sunday evening), strong to moderate easterly/easterly flow was approaching the terrain north of San Francisco, something shown by the 6hr forecast of height (like pressure) and winds at 850 hPa (about 5000 ft)--a forecast valid at 11 PM Sunday night (see below). The strong winds and their orientation was the result of cooler air and high pressure moving into the Northwest during the previous day. So we had modestly strong winds (30-50 knots) approaching the terrain. A very favorable situation for strong mountain-wave winds is a stable layer at or just above crest level. A stable layer can be noted when temperature is steady with height or increases with height (an inversion). The nearest vertical sounding (radiosonde launched weather sensors) was at Oakland, CA. The sounding at 5 PM Sunday DOES shows an inversion at the right levels (see plot), roughly between 850 and 800 hPa (roughly 5-6 thousand feet ASL). A group at the Desert Research Institute runs a forecast model (WRF) at very high resolution (2-km grid spacing). Here is their 6-h forecast for sustained surface winds at 11 AM Sunday. OMG...there it is. You can see the banded structure of strong winds over and immediately downstream of major terrain features, with lower speed winds near sea level. I inserted a terrain map below...you can see how the wind maxima were oriented the same way as the ridge lines. And the model reveals something else: the enormous horizontal variability of the winds during such events. Professor Rob Fovell of the University of Albany completed another high resolution simulation, one initialized at 5 PM on Thursday. Here are is a vertical cross section though the Tubbs fire that affected Santa Rosa. You can see the acceleration of winds (sustained) on the slopes. The predicted winds at the Tubbs site was scary strong, with max winds around 70 mph. 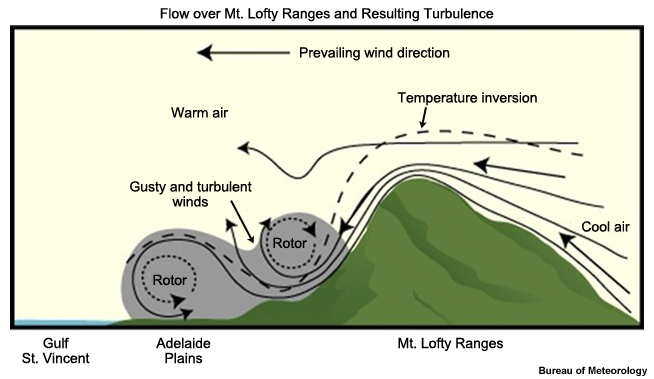 The creation of such downslope mountain-wave type windstorms is very sensitive to the characteristics of the air moving towards the mountains. You not only need strong approaching flow, but the proper vertical structure of temperature and winds. Clearly such conditions don't happen often--otherwise similarly strong winds would have occurred before. There is no reason to expect that such extreme wind conditions were made more probable by global warming. So I think we can outline what happened Sunday/Monday of last week. On Sunday afternoon, winds approaching the mountains of northern CA increased, and the vertical structure of an inversion over cooler air was established. A strong mountain wave/downslope wind event was initiated, bringing winds of 60-90 mph to the crests and upper lee slopes of the regional terrain. Such winds helped initiate the fires (possibly due to interaction with power lines) and then caused the resulting fires to explode. The fires, driven by the strong, gusty winds, pushed very rapidly into populated areas. The good news in all this? Our models seemed to be able to simulate this event, providing some warning of the imminent wind acceleration. What could be done with such information? Much better warnings of a potential blow up? Shutting off the power to threatened communities? There are lots of possibilities. But one thing is for sure: we can not let this happen again. And the first step is to really understand what happened, without assuming we know the answer beforehand. Too many people are suggesting the wildfire event is all about climate change, when it may prove to reflect a severe weather event unrelated to global warming. Similarly, some of the same folks claimed that the great rainfall with Hurricane Harvey was all about global warming, when a stalled storm was probably more to blame. Only by knowing the true cause of disasters and acting on that information can we protect people in the future. Few follow up points. A fraction of that 10 billion in losses could easily pay for computers capable of much more advanced modeling. Overlay that data on the power grid maps, and computers could easily (and automatically) disable grids in high risk areas. That said just about any spark in the affected areas was going to create a firestorm. I grew up in the foothills of LA where dealing with the "Santa Anna Winds" was a way of life every fall. The homes left standing when it was all over, were those that were prepared for such events. 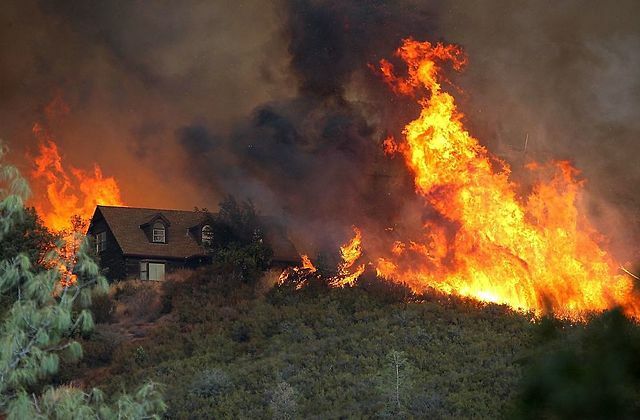 Homes can be built to withstand such fires; Proper roofs, fire retardant eve's, fire resistant exterior walls, 50-100ft clear zones around structures. These should be basic code requirements for those areas, much like homes built in 100 year flood plains. We can and should expect to do better in the future. "Geary says that the winds were so strong in his Lake County-area rancheria that the tops of electric poles sheared off, and wires and transformers struck the ground." All fine and good Cliff. You have a high titer against the type 1 error. But, do you have evidence of the power of your test? What is the chance that those winds were made more likely by a warming world? As everyone knows, it is really hard to link weather events to climate change, but that is also to say that it is equally or more difficult to eliminate climate change as a cause of a weather event. California has 100 million dead trees, from a drought that is very likely related to global warming and the loss of Arctic sea ice, according to climate scientists like Dr. Jennifer Francis. So, you can claim that the winds that night were unrelated to global warming, but what about the 100 million dead trees? Would the fire really be this destructive or hard to control without the probably global warming related dead trees and extreme rainfall of 2017? Fire severity and fire season length has been steadily increasing, as CO2 concentrations in the atmosphere have increased, throughout the western U.S.. I lived in and built homes in So Cal also, especially in the area of the San Gabriel Mountains. One thing we changed in the mid-1990s was the use of cement board (Weyerhauser, Hardi etc.) for starter boards over the eaves. Also using 4X6 rafter tails, 24"O.C. for the same eaves. This combination gave you a minimum 1 hour fire rating . Most homes burn when the embers become trapped in the eave space, and spin around and around, unable to get out, then starting the roofs on fire. Asa you say, this type of thinking and building does not cost any more, but makes it much more safe. Thank you for this Cliff. Although I live in Seattle now, I am from Santa Rosa and know the area affected very well. The fire pushed down the Mark West creek canyon which is on the leeward side of a 2000 ft ridge from Calistoga/Napa Valley. The fire seemed to funnel down that canyon with incredible speed. Those in the funnel had no chance while even being on the edge was a chance at getting by unscathed. The neighborhood I grew up in was right on the edge of that funnel. The half that was inside got decimated and the half that was facing away from the canyon funnel survived. My mom and sister's house was in the lucky half and fire burned within a few hundred yards of their home. I know many people who were in the funnel and weren't so lucky. I will pass this blog post along for those searching for answers. Donald Strong, I see no reason to expect stronger winds due to global warming. In fact, my research suggests the opposite, large scale disturbances will deamplify under global warming. Regardless of what caused the fire conditions to be extream, fires are a natural part of nature. Building on a floodplain results in buildings being flooded. Building in areas that "burn" by nature...results in buildings and lives being lost. There are ways to mitigate building in these areas but you can not "prevent" these fires from happening. Good writeup Cliff. I have been a meteorologist in Northern California for over 40 years and helped develop the California RAWS program and CANSAC. Quite a while back a fire weather meteorologist from Southern California gave wrote a paper that attributed the strong “Sundowners” to a hydrostatic jump. Interesting that the temperature at Santa Rosa jumped to 91 degrees when the winds spiked, seems to support the surfacing mountain wave. A little more background. Back in the 1970s, before RAWS, we relied on “fire lookouts” for weather observations. One of those lookouts was just above the 6000 foot level on the Mendocino N.F. (NW of the fires). At least once a fire season during the spring and fall this lookout would report wind gusts of 80 to 100 mph from the NE after the passage of what looked like a weak short wave trough. These strong northeast to east winds behind trough passages were also observed on other peaks over the higher elevations north and east of the Sacramento Valley. While Hurricanes Harvey, Irma, and Maria plus the fires in Northern California cannot be attributed to the degree of global warming thus far, it does seem like Mother Nature has been giving us a preview this summer of the severity of catastrophic weather our children (or grandchildren in my case) may experience at the end of this century if the forecast rise in temperatures comes to pass. Unfortunately, we humans are not very skilled at taking steps now for things that are likely to occur in 50-75 years. Keep in mind that the scriptures teach where wind comes from, i.e. "he bringeth the wind out of his treasuries." Once again Cliff will not engage in alarmist rhetoric that is not supported by evidence, yet the screechers still come on and bray at will regarding his heresy. Be lucky you weren't around Salem in the early part of the 17th Century, Cliff, or else you'd have been burned at the stake. It's probably worthwhile to point out that the Tubbs fire had a very specific precedent. The Hanly fire of 1964 followed the same path as the Tubbs fire in similar weather conditions. The main difference between the two events is that there are a lot more people living in that area in 2017 than there were in 1964. "Mother Nature has been giving us a preview this summer of the severity of catastrophic weather our children (or grandchildren in my case) may experience at the end of this century"
What makes people say things like this? A need to dramatize life, I guess. Statements like this aren't based on a bit of deductive logic, professional education, or personal experience. Dr. Mass keeps trying his best to explain what's going on, but apparently people only hear what they want to hear. There have probably been worse fires and hurricanes for sure. However there has never been so many people in the way of them. Personally, I'd rather "believe" these events are related to climate change and take steps to turn things around than to live life denying climate change. John k, I think more an more people are looking out their windows and seeing the polluted mess that we are creating. No matter what science says, we are changing the world, to me , it doesn't look better. John K. It would be helpful if you would read comments more carefully before responding with ad hominem attacks. I said these evevents are a preview of the severity of catastrophic weather our children (or grandchildren in my case) MAY ((not will)experience AT THE END OF THIS CENTURY. Professor Mass himself has said in this blog that there will be effects from the warming atmosphere and oceans by the end of this century. The exact nature of these effects cannot be predicted with certainty—hence my use of MAY. Thanks for providing a great description of this weather event. I lived in the norther California coast ranges for 8 years including 3 in Santa Rosa. The area becomes fire prone every year and somewhat more so after a wet winter. Fires were always a concern from June till the fall rains arrived. I never recall high winds in the fall. Your initial go at this points to this being a very rare event. If rare, that might explain the severity of the damage as policies may not have been in place to consider this low risk but high consequence event (building codes, response). In thinking (at a shallow level) about your idea of shutting off the electric grid; it seems this idea has some merit. Large earthquake alert systems have been set up and are being set up to do just that. The accuracy of the prediction for this wind event gave plenty of warning and getting rid of ignition points makes sense if the down side is not so bad. For such a rare event maybe a better more cost effective approach than requiring expensive building codes within urban neighborhoods (Coffey Park in Santa Rosa) that are well away from the wildland/urban interface. If strong winds are the problem, undergrounding is the solution. Netherlands or Switzerland can do it, maybe "he sixth largest economy on planet Earth" can handle it too. The tendency to blame every non-average weather event on global warming is a sign of the growing desperation within that religious cult, which once piously lectured everyone about the difference between weather and climate. Cultists, you have jumped the shark, and are now your own best self-parody. 2) A century of fire suppression has built up fuel loads. Natural fires once created mosaics of natural fire breaks and reduced fuels. The more people settle in fire prone areas the greater the demand to suppress natural fires. Most trees are adapted to low intensity periodic fires that occur with low fuel loads. 3) Changes in the water table that kill trees have been caused by human impacts that retard groundwater recharge and accelerate groundwater extraction. Due to flood control efforts designed to get the water off the land as quickly as possible, stream channels have been straightened, hardened and freed of debris and vegetation that would normally slow the flow and promote groundwater recharge. In some places channels have been created and engineered often to divert water from flood plains that people have colonized. However all those practices reduce the recharge of the local aquifers that keep trees alive during natural droughts. In addition residential and agricultural needs are increasingly extracting groundwater that trees depend on to survive natural droughts. I've worked fires all over CA for over 40 years. These types of fires happen with high winds. I've seen snow-down enhanced fire, drought-enhanced fires, etc. It's mostly the wind. Go back to 1964 for record on the Handley Fire. Burned from close to Middletown to Santa Rosa. Bigger than the current fire. The destruction was much less as there were not so many houses. Winds make huge fires. Houses make huge damage. I can think of very few extreme fires I worked that were not caused by wind. Blaming it on global warming is just a simple way of setting a mind. Regarding the amount of acreage burned this year, I saw that from 1926 to 1952, every one of those years was greater in # of acres burned, with this year's acreage only being 1/5th of the largest year in the 20's. Fire suppression a reason? Especially interesting are the studies from the 30's, showing a similar problem, indicating that our Climate has been through many droughts all through the State's history, and the other links to unwise water management are very good also. Preparation is most important. If people cared about forest fire control, they'd study how it's done on private timberland. Oh, but wait! That would require "environmentalists" to cease their war om logging. Sounds like it was mainly grass fires, but I'm not sure. Great article with not so great last paragraph. While media has a tendency to stretch, in this case the news headline “Global warming is making wildfires and hurricanes worse, Al Gore says” is actually backed by a rigorous scientific method. As far as the fires, there were some record-breaking heat waves in the region not too long ago. This year’s California summer was the hottest on record. Rising temperatures are making vegetation drier and easier to burn. Many peer-reviewed studies show more extreme droughts and floodings, allowing potentially for more favorable fuel growth by the time the increasingly scorching California summer arrives. Undeniably, fire seasons are getting longer. As far as Hurricane Harvey, it would be fairly straightforward to do a sensitivity simulation with normal (cooler) temperatures in the Gulf and compare it to today's elevated temperatures. Even a simple thermodynamic relationship, known as the Clausius-Clapeyron equation, will tell that the story is: Water evaporates faster from a hot surface than a cold surface, leading to more precipitable water in the atmosphere. We don’t even need a fancy simulation, do we? And here is another fact backed by a scientific experiment. Climate change alone can increase rainfall 5 to 10 percent. But during naturally very high temperatures, this increase is even larger (nonlinear feedbacks, Trenberth). It is not all about climate change, but “Global warming IS making wildfires and hurricanes worse”, as was the case for both the recent California fires and Hurricane Harvey. Matus - my thoughts exactly. I was scratching my head at whatever the point was in displaying Al Gore's statement followed by criticism of storms / wildfire being "caused" by global warming. He plainly doesn't say that. California is not out off the woods yet. Santa Ana’s on the way and looking to stay for a while in the south land. Mass demob on existing fires to get units ready to go down south. California fire siege part 2? Usually when the state experiences extreme offshore wind conflagrations it’s either in NorCal or SoCal. This could be the first time, in a long time, that both ends of the state experienced a large fire sieges so close together. I remember in the week before halloween (1993) I was closing down our seasonal station as the fall rains filled the creek behind the engine bay in Northern California. At lunch I turned on the tv and looked at amazement of homes burning and fire jumping highways in Riverside County. I knew that we were going to be called up, and sure enough, 30 minutes later, a strike team (5 fire engines and a battalion chief) was called up for immediate need for down south. Matus Novack Martini, your cult has grown desperate. You once piously cautioned that weather wasn't climate, but now you seize on every non-average weather event as evidence that your religion is true. The funny thing to me is that so many of you seem to think we haven't been paying attention. Further more your increased rainfall and hurricane analysis is faulty. Indeed higher air temperatures allow the air to hold more water vapor, but you misapply a global temperature to the region. According to the peer reviewed paper "The coastal ocean response to the global warming acceleration and hiatus" by Liao 2015 temperatures along the gulf coast have cooled since 1998, while rigorous science has long shown the southeast USA is a "warming hole" where maximum temperatures are about the same as in the 1900s. Furthermore nearly every extreme weather event, whether it be flood inducing rains, heat waves or extreme snowfall, has been associated with a slow moving, stalled storm system. Responsible blocking pressure systems have been known to occur for centuries. To blame CO2 warming your sensitivity analysis must address how CO2 can caused the hurricane to stall, but you truly lack any "rigorous science" to support your dubious global warming attributions. It is one thing to blame global warming for all the major catastrophes, which neither Al Gore with his headline, nor I with my contribution to the blog's discussion did. It's another thing to claim climate change does make them worse or better, which was the point of my comment contribution. There is a difference. For the casual reader, which seems to be the audience of Cliff's blog, it would have probably been beneficial to keep the discussion focused on wildfires and not to mix them with hurricanes. Did the extremely dry vegetation cause increased wildfire risk, and burn more explosively or not? Since the first declared fire seasons in California by the California Division of Forestry back in the 30’s, on average, the seasons have grown longer. Every year CAL FIRE bases its staffing levels off weather conditions, fuel conditions and fire activity. When Units are in Summer Preparedness it means all fire stations are open 24 hours per day, seasonal firefighters have been hired, and the potential for wildfires is much greater. More fuel or more people are not a factor that determines when you are in season or not. Fire season is not based on possible increased arsonist copycats or a new housing project in the wildland. It’s fuel moisture’s and mid term weather conditions that will have an effect on the staffing patterns. State foresters, fuel specialist and climate scientist have been documenting springs where fuels cure faster than in the past and stay drier from years before. Fire Units in the North, have on average, increased their Summer Preparedness staffing levels a month earlier (May instead of June). Fire Units in the South have stayed in Summer Preparation longer that stretches into winter and or even stays in season all year long. These are not one off fire season changes. We can all agree that forest mismanagement and more people living in the wildland is a major factor in large sieges. But the fact remains that state fire managers in Sacramento are budgeting towards early and late fire seasons due to faster curing and longer durations of low fuel moisture’s. When does something become a factor? When does the goal post stop moving? 50 years...100 years? Its safe for people to say “not yet but in the future”. It keeps them comfortable and righteous above the alarmist (damn media). But they also miss the conversations that are happening below the big fire seiges between state climatologist, meteorologists and fire managers that have real effects budgets, planning and lives. The only issue with requiring 50-100 foot clear zones is that's not possible when lots are about 100X50. That's the problem with modern urban planning too much density does not allow for clear zones. Mattus says "Did the extremely dry vegetation cause increased wildfire risk, and burn more explosively or not?" Dry vegetation always causes more explosive fires, whether during Little Ice Age fires or now, whether or not there was a record hot summer, and whether or not those temperatures were natural or CO2-induced. Pushing the "record hot summer temperature" is misleading for the following reasons. First Northern California's maximum temperatures have not exhibited a warming trend since the 1930s. Second The Santa Rosa plains are an Oak Savannah with grasses as the primary fuel. The grsssland fuels are chacterized as "1-hour fuels" that the natural summer California drought had already dried the grasses. 1-hour fuels equilibrate with the environment within one hour and thus the natural dry Diablo winds would dry the grass to explosive levels as soon as they began to blow. Brush is a 10-hour fuel that likewise dries out within the day. Furthermore studies of 1000-hour fuels (because they are thicker pieces of wood like an oak branch) show that large woody debris in the region falls to the critical dryness of 12% or lower by the first of July. When 1000-hour fuel reaches that 12% level, all the other fuels have already reached the dryness to create explosive fuels as the California climate creates every year. The record summer temperatures were a meaningless factor, and global warming whether natural or anthropogenic did not make it the fire worse. Implicating global warming is the demagoguery of politicians. The fuels just needed an ignition source, which the downed powerlines from high winds provided. The greater Santa Rosa region's topography, coupled with the weather Cliff illustrated, accelerated the winds, and funneled the flames towards Santa Rosa, just as happened in the 1964 Hanley fire. You might blame humans for extending more power lines into fire prone areas as populations grew, or blame them for drying out the region's vernal pools. The only way to argue global warming made the fire worse is by ignoring all the other factors that created this devastating event. Pushing the global warming hype only distracts from educating people about what micro-environments are prone to naturally explosive deadly fires and teaching them to either avoid such areas or if they are building in such regions, they must do so to protect themselves from the inevitable natural explosive fires. @Jim Steele, please quit it with the facts. "Progressives" hate that. Here is a picture showing that the fires spread quickly via the 1-hour grassy fuel loads. You can see the shrubs and trees were not a factor, only slightly burned. In September of 1964 I was working for the then, Calif Div of Forestry, (now Cal-Fire). I was stationed at Middletown Station in Lake County. At mid-night I was dispatched to the south side of Mt St Helena to the "Hanley Fire". Surface winds in Middletown were no less than a steady 60 mph plus out of the north and gusting to who knows what???? 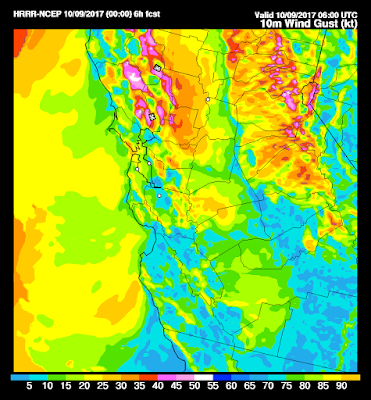 While enroute I heard the look-out gal on Mt St Helena tell St. Helena Headquarters that the last wind she had was 110 mph from the north and the wind speed indicator blew off of it's mounting bracket. She then immediately said " I am leaving the tower now" . True story. Jim, yes the record hot summer was a secondary factor to other meteorological conditions, and it's not clear whether it mattered at all, at least for the grassy fields as you point out. The other important factor is the atmospheric humidity, which really was at a very low point. These winds were hot and dry, which is generally the case for late season after all the summer heat accumulation in the system. In general, we know that the fire seasons are getting longer. Also Prof. Tom Swetnam, whose study you mentioned in one of your earlier comments, said in a very interesting interview with NPR that "climate change is causing earlier snowmelt—which can lead to bigger, hotter blazes." Mattus you are obsessed with injecting a CO2-induced climate change angle. Indeed the winds were hot and dry. But their rising temperature and decreasing relative humidity is due to adiabatic changes and winds descend from higher elevations. No CO2 impact at all. In fact during droughts any increased temperature due to a greenhouse effect is actually reduced since H2O accounts for over 80% of the greenhouse effect. Dry air increases solar insolation. So just how are fire season's changing relative to natural variability? Regards ignition, 95% of California's fires have been ignited by people. Human ignited fires are not constrained by a lightning season. Human fires are ignited in all seasons. Furthermore a reverse of the fire suppression policy now lets fires burn longer if they do not threaten humans. Finally the Diablo Winds of Santa Rosa or the Santa Annas of Los Angeles are driven by the cooling seasonal temperatures in the high deserts to the east. The inner continent cools faster than the oceans, setting up a pressure gradient driving the winds toward the coast. The winds then heat adiabatically rising 5C for every 1000 feet of descent . If CO2 is warming the earth to any significant extent, then we would expect the inner continent to warm faster, or cool more slowly than the oceans, affecting the pressure gradient in a manner exactly the opposite of what drives the hot fire season winds. Great article and echos exactly what I've been saying. I keep seeing civil lawsuits prompting people to sue pg&e which is ridiculous. Our non profit horse rescue houses several horses on tubbs lane in Calistoga. As I was feeding our horses that fateful Sunday night, I videoed the wind gusts as I'd never experienced anything like them here. This picture depicts a common, even routine, grass fire throughout California. Whether a rapid or slow rate of spread, flame lengths and intensity of typical grass fires rarely result in torching of the relatively fire resistant foliage of the wide variety of native California Oaks. In this context "shrubs and trees" are rarely a factor in fire spread. And the grass fire is typically pretty easy to deal with by any competent fire crew. The driving force in the spread of these recent fires is the ember fall ahead of the fire front. The grass does not produce significant ember fall. I'm curious to learn whether Mr. Mass has access to weather data from September 1964. The footprint of the Hanly fire in '64 and the Tubbs of 2017 are darn near identical. Was there a similar wind event in that country 53 years ago? I live there. I was in the Sulphur Fire in Lake County..north of Santa Rosa, Can. This last summer was the hottest that I can remember and I have been here 35 years. The night of the fire was windy, but not much different than other windy nights. It is windy here frequently. The fire moved fast. It is extremely dry here. I tend to buy CM's argument that the unprecedented (at least given the available record, which appears to be short) wind even was the primary driver of the fires here. And it probably didn't need more. That said, the available fuels exhibited a perfect storm of factors--all of which were created by California's recent: worst drought in 1200 years, then wettest year on record, then hottest summer on record. This confluence of events has been suggested by guys like Dan Swain to be climate-change-related. http://www.sfgate.com/bayarea/article/Sudden-oak-death-likely-exacerbated-deadly-12292099.php That said, I'm not aware of any relationship between SDO and anthropogenic climate change. As I have said the rapid spread of wine country fires were fueled by small diameter wood and grasses that can be dried out in just hours and days. Thus there is no reason to suspect a climate connection or that thick oak branches were a factor. The grasses do not provide many long lasting ember that caused the homes to burn, but the chaparral's 1-hr, 10-hr and 100-hr fuel loads do. Although I like Swains weather blog, Swain seems to confuse weather and climate effects. I have written a more detailed account of all the components - ignition, fuels and spread -that contributed to the wine country fires here where I link to the paper showing human started fire season is 3 times longer than natural fire season. You lost me at OMG. PG and E were behind 3500 work orders to clear vegetation and make repairs in the area of the Napa Sonoma fires. And were those dead trees not cleared out? Because environmentalists go berserk over letting fireroafs be cleared so that those dead trees can be cut and removed. When they become fuel for fires, then they shout "global warming." And the arctic ice is growing, not shrinking. Google it. I get so tired of hearing things like "worst storm ever!" "Worst fire ever!" Weather records for this country were not even started until the late 1800's. Before that there are only surviving diaries and other written records to look at. We do know that there was a monster hurricane in the mid 1700's that has yet to be matched. Did "global warming" cause that? The horrific draught in the mud section of the country in the 1930's? Weather goes in cycles that can last 30-40 years. You do realize that Kansas was once a deep rain forest and Death Valkey was a sea? Global warming didn't change that. Normal weather cycles over millions of years did. A couple of questions if I may? The Santa Rosa fires burned down housing tracks that nothing would have prevented. It looked like Dresden. 80+ mph winds with those tripled by the firestorms themselves. I saw 4’x8’ burning sheets of plywood on fire traveling a thousand meters. The fire came within a mile of my house and burned down my Dads neighborhood. My wife and I were up all night concerned about the oak trees surrounding our house burning down long before fire. BTW we started smelling smoke at 8:30pm. Hours before the fire was on our side of Tubbs. Yes. Poles with transformers that were top heavy were especially susceptible to this. PG&E did nothing wrong. It was an act of God. The winds were scary. The only time I’ve seen comparable winds in the past was in heavy winter storms. In the winter storms blow trees down onto power lines regularly. Most of our power here is underground but there are just some places it can’t be done. Climate change has been happening through out the worlds lifetime. There is plenty of evidence to back up the fact we go through weather change cycles. The question is how much is it a result of man if at all. Sorry dead trees had nothing to do with it. Regardless of what climate scientist Jennifer says. And sudden oak death syndrome. We have plenty of water in Northern California. Southern California is a desert and always has been. With out our water they are done. Global warming or not. What happened to the coming ice age predicted by climate experts due to the hole in the ozone. Hopefully it’s venting out all that co2. Northwest Weather Believe It or Not!